This is one of my first woodworking projects... Well, okay not the first. There's the gun rack I made my grandfather in 5th grade, there's the book rack I made in 4H club when I was... um... 12 maybe? By first I mean, of the stuff I made as an adult that wasn't just banging two boards together. When I made this table I had a very limited set of tools and much less experience than I do now. All those caveats aside I'm still really happy with how this table came out. The table is a sheet of 3/4" maple plywood mounted on 2x3 pine legs and frame. The table edging is 1x4 pine. The entire table is finished with a walnut stain and polyurethane. I made the table movable by bolting it together with carriage bolts. 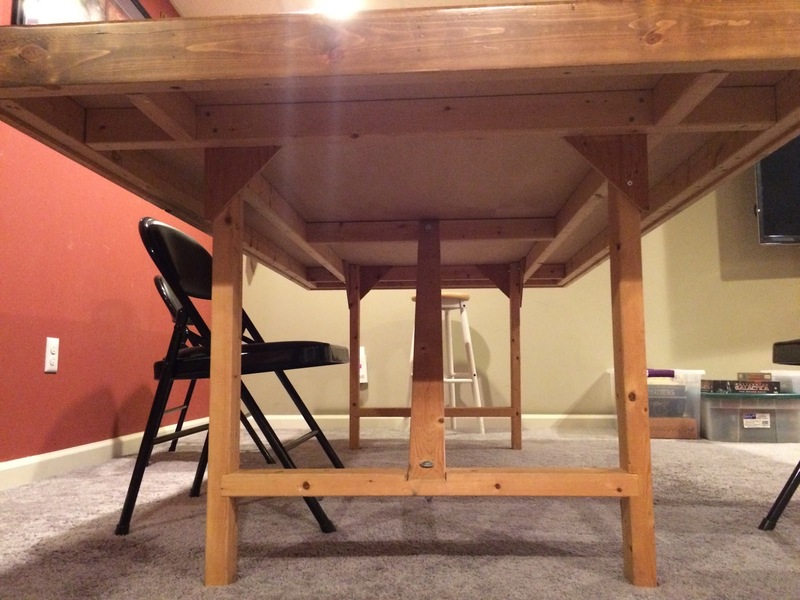 The 2x3" leg assembly under the table will stand on its own. I can attest that this worked out just fine. 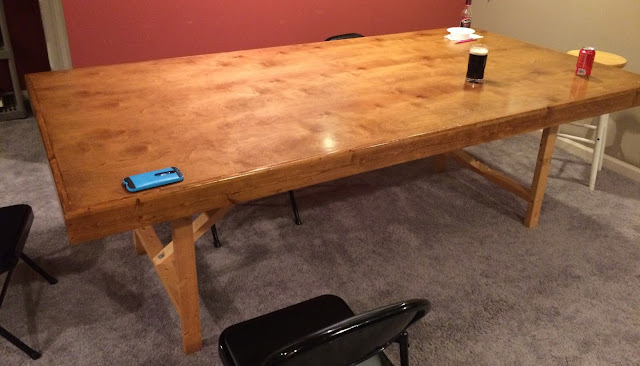 I built it in my basement, took it apart and moved it to my game room, then five or ten years ago took it apart again and moved it to a friend's house in New Jersey. The end leg assembly consists of the lower horizontal rail, the upper horizontal rails and the two legs. I added gussets to the legs for strength. The gussets go across the width and the length of the table. The upper rail has a half lap joint that the rails run the length of the table drop into. The entire end assembly is glued and screwed. The mid-table brace is attached to the two long rails with hanger bolts nuts and washers. The two cross braces have a single long carriage bolt run through them and the mid-table brace secured with washers and nuts. They are attached to the leg assembly using a shorter carriage bolt and washers and nuts. The long rails are fastened to the leg assemblies with more carriage bolts and nuts through the gussets. The top just sits on top of the legs using gravity to keep it in place. It isn't quick to move but it does come apart and go back together without wearing out screw holes. Portability accomplished! The combination of the glued legs, the gussets and the angled cross braces make this table very solid. I never tested it to destruction; however, It's had large full-grown adults standing on it and it didn't so much as bend or wiggle. Strength accomplished! The full 4x8 top gives plenty of room for miniature games. The extra large size gives plenty of room to put notes or stage units. Large size accomplished! I forget exactly how tall I made the table. I do know I split the difference between a sitting table and a standing table. One of the problems with playing miniature games over a normal sitting table is that you can end up hunched over for hours. By the end of the game your back can be sore enough that you don't care if you win or lose. So table height accomplished? What I ended up with is a table that is uncomfortable to sit at and isn't quite tall enough to stand at comfortably. What I accomplished is a table that is equally uncomfortable to stand or sit at. I offered to adjust the height to make it better for one or both of those activities. He has so far declined all offers so it will stay as it is. The only other big problem with the table is that the top isn't fastened to the legs. Oddly enough the weakest part of the table is when someone leans on the end of the table. If the person weighs anything at all the entire table will lever up. I've never seen the top come all the way off but I have seen games disrupted because the pieces went everywhere. There is also a smallish problem in that the large size makes the table awkward to play four player board games. It's even a bit large for most any board game as someone (or everyone) has to reach to get to the center of the board and often stand to reach the far side. If I were to make this table again the principal thing I would change is the height. I'd make it the correct height for sitting at and include some leg extensions that would raise the table to a better height for standing at. I'd also fasten the top to the legs, probably with some turn buttons to avoid the levering problem.